28 September 2017 – McLaren Technologies has completed a cutting edge, custom-designed installation in Parramatta (Western Sydney) at the city’s spectacular new SKYE Hotel Suites Parramatta. The hotel, which marks the debut of the SKYE Hotel Suites brand for Australia, is Parramatta’s first ever five-star hotel, setting a new standard of luxury for the destination regarded locally as Sydney’s ‘second’ city. “Parramatta is proving itself a true rival to its Sydney CBD sister in terms of business, population and high culture,” said McLaren Technologies Managing Director Matthew White. The project, which concluded in time for the hotel’s public launch in August, was overseen from conception to installation by the McLaren team, and based around the installation of two leading Intelity products for its complete guest service platform – ICE (Interactive Customer Experience™), and MiKEY (mobile essentials). 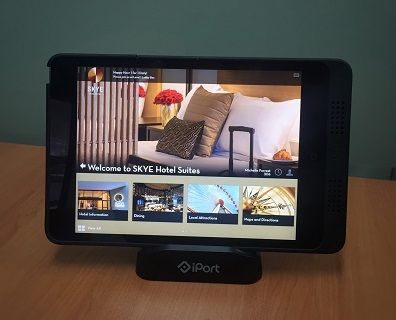 The Intelity digital engagement platform implemented in each room on an iPad and available in a mobile format for guests to download on their own IOS or Android device integrates to all major hotel management systems including HMS PMS from Infor, InfoGenesis POS, HotSOS Workforce Management Solution from Amadeus Hospitality and Assa Abloy Door Locks. It also has the functionality to act as a virtual concierge for guests via a tablet device that allows guests to arrange everything from room service to booking off-site tours at the touch of a finger. Intelity’s MiKEY technology is equally convenient for hotel guests, effectively turning any smartphone into a room key by way of a simple app download, prompted and validated by the hotel. In addition to digital key functionality, the app also provides mobile check-in and check out for express arrivals and departures, completely negating the need to ever visit a reception desk.